So, we all know who Rosa Parks is, but how many of us have heard of Mike Ilitch? Mike Ilitch was the founder of Little Caesar’s and owner of the Detroit Tigers. Unfortunately, he passed away this Friday at the age of 87. To honor his death, one of his most kind hearted stories resurfaced to the news this week. In 1994, Rosa Parks was robbed in her home and eventually moved to a safer location in Detroit. After hearing about this, Ilitch immediately contacted Damon Keith, the federal judge and civil rights activist who helped move Parks. He discreetly offered to pay for Parks’ rent every month and has done so since 1994 to 2005, when Parks passed away. I found it extremely interesting that a man who owns multiple businesses did such a great act of kindness out of the goodness of his heart, and not for the publicity. 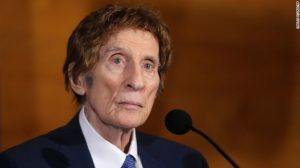 Also, in today’s world, it is common for some companies and CEOs to not want to get involved with certain activism movements to prevent hurting their businesses, so I commend Mike Ilitch for doing something he believed in regardless of how it might’ve affected his business if it had came out earlier.